Congratulations to all the semifinalists, this was a very strong field of submissions. We hope to announce the winning manuscript by the end of the month. 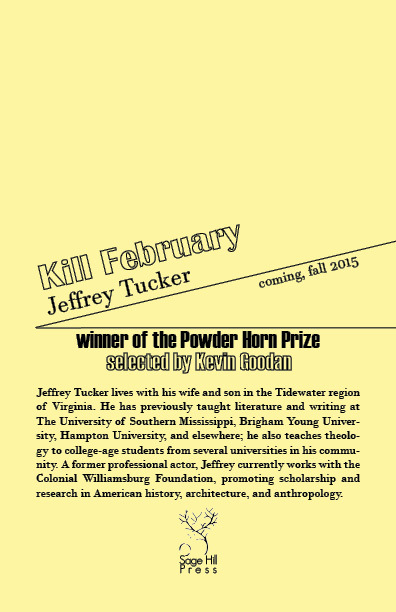 In the meantime, our previous winner, Kill February by Jeffrey Tucker, selected and introduced by Kevin Goodan, is now available on Amazon (http://www.amazon.com/dp/0989035956). A shortlist of four titles will be forwarded to judge Nance Van Winckel, with the winner to be announced soon. Thanks to all of our entrants. Even paring to this list of 13 was a difficult job, given the overall quality of the submissions. The submission deadline for the prose edition of Railtown Almanac has been extended to November 1! We want to make sure we get a wide sampling of Spokane-area prose writers, so if you haven’t gotten your stories or essays in, please consider doing so. Sage Hill Press is happy to announce that we’ll be publishing the forthcoming anthology, “All We Can Hold,” a collection of poems on motherhood. Editors include Elise Gregory, Emily Gwinn, Kate Maude, Kaleen McCandless, and Laura Walker. Sage Hill Press is now accepting manuscripts for the next Powder Horn Prize, a first book award. Our final judge will be Nance Van Winckel, author of six poetry collections and three short story collections, and Ever Yrs, a novel in the form of a scrapbook/photo album. Nance is often interested in work that pushes against boundaries or form, genre, and language. To be eligible, writers should not have previously published a full-length poetry collection (though chapbook publications are fine). Manuscripts should be at least 45 pages in length, 1.15- or 1.5-spaced. The author’s name should not appear anywhere on the manuscript. Sage Hill Press follows CLMP submission and contest ethics guidelines. If you are a current or former student of Nance Van Winckel, please do not submit to the contest. Entry deadline is August 31, 2015. Entry fee is $20, and includes a copy of a past prize-winner. In your cover letter, please indicate which title you’d like, The Eyes the Window by Marci Rae Johnson, or Kill February by Jeffrey Tucker (to be published and shipped fall/winter 2015) and include your mailing address. All manuscripts should be submitted via Submittable, accessible in the right-hand tool bar on the website, or by clicking here. We are now accepting prose submissions for the forthcoming edition of Railtown Almanac. We’re looking for short stories or essays by Spokane residents, or about Spokane (residents need not submit work about Spokane. Non-residents must submit work about or set in Spokane). Please submit no more than four pieces, each up to 3000 words in length. Submissions will be open until August 15, 2015. All work must be submitted through our online submission system, which can be accessed through our homepage, or by clicking here.